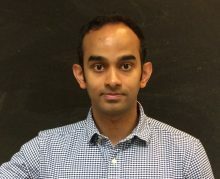 Dr. Kaalak Reddy, who is currently continuing his post-doctoral training in the lab of Dr. Andy Berglund here at the Center for NeuroGenetics, has been awarded the prestigious Myotonic Dystrophy Foundation (MDF) Fellowship. Dr. Reddy completed his Honours BSc in Genetics in 2006 at Western University in London, Canada. He went on to do a PhD degree in the lab of Dr. Christopher Pearson at the University of Toronto and the Hospital for Sick Children from 2006-2013 followed by a postdoctoral fellow position at the University of Edinburgh in the Medical Research Council – Human Genetics Unit in the lab of Dr. Andrew Jackson. Kaalak joined the Berglund lab in September 2016. Only two MDF Fellowships are awarded each year nation wide.